A Beach Day in January! How's the weather where you live? Is your January cold or warm? If you have a cold January this card by Samantha will warm you up today! She used the palm tree image from the Paradise Palms stamp and inked it up in green and brown to create two colors with one stamp! So cool! I love how she added some watercolor splashes for the water and some for the sun too! 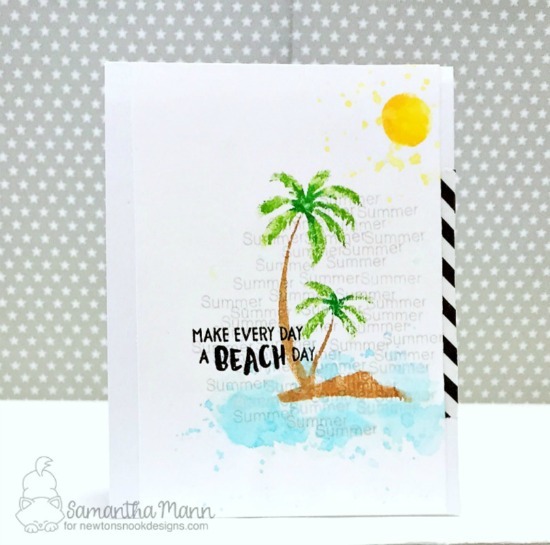 Then she stamped the word "summer" repeatedly from the Simply Seasonal stamp set in grey and added the "Make every day a Beach Day" from the Aloha Newton stamp set in black! What a fun summery card. This card makes me want to take a tropical vacation to get away from the cold weather here! Thank you Samantha for the warm and tropical card today! To say hello to Samantha and see more of her awesome creations, you can visit Samantha's Blog, Sam's Scrap Candy! Stunning design! Love the clean and simple look, amazing color combo and the soft stamping on the background! January Blog Hop Winners + New Release for Sale! January Reveals - Day 4 - Newton's Happy Mail! New Inky Paws Challenge #39! Sneak Peeks for our January Release! A New Year, A NEW Inky Paws Challenge Blog!